Our collection of fully coordinated stylish nursery linen and baby wear essentials will cater for your Baby’s every need at bedtime, bathtime, and playtime. 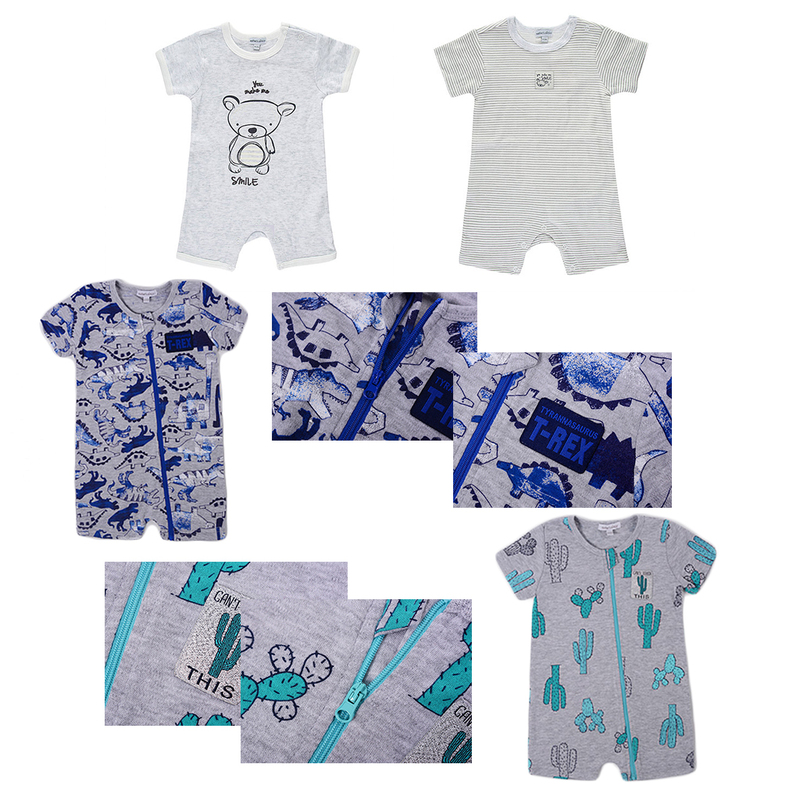 This adorable pack of 5 short sleeves onesies can be a summer outfit or winter when paired with a pair of leggings. The coordinated designs of this three pack bodysuits are elegant yet subtle. Made from the softest cotton, these baby bodysuits include expandable lap shoulder neckline and snap closure buttons at the bottom for speedy diaper changes. These bodysuits (onesies) are great to take baby out of the house in, and make for wonderful gifts, whether for a new birth or a baby shower. This bright and colorful bodysuit is suitable for sleep and play. The snap buttons from top to toe makes easy to put on and take off and diaper change convenient. Built-in feet help to keep baby cozy warm all over. DIAPER CHANGE MADE SIMPLE: Snap buttons conveniently positioned from top to toe for ease of changing baby’s diaper. CUTE & PRACTICAL DESIGN: Bright and colorful tiger design. Built-in feet help to keep baby cozy warm from head to toe. This set of rompers make for an easy outfit for your little one. Inner leg snap closure and top snap make for an easy and quick diaper change. 100 % cotton interlock 180 gm. Each of the set of 3 designs are carefully colored and crafted so you can match our bibs and burpcloths with any trendy outfit. This set makes a perfect baby shower, birthday oR Christmas gift. 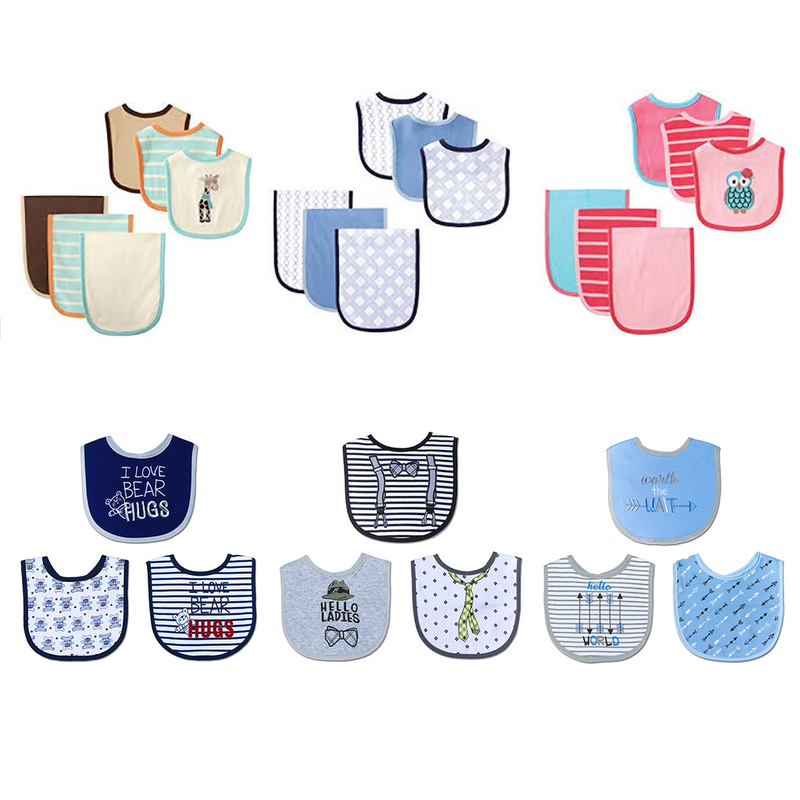 This 6 Pack of baby bibs and burp cloths are soft and absorbent for mom and soft for baby! Adorable themes have 1 bib and 1 burp cloth embroidered and 2 bibs and 2 burp cloths a fun matching print. Baby 10 pcs gift set of Bodysuit, T-Shirt, Pants, Hat, Mittens, Bib, Socks & 3 Wash Cloths. 100% cotton interlock 180 gm. Box pack with hangtag. Our collection of fully coordinated stylish nursery linen and baby wear essentials will cater for your little one’s every need at bedtime, bathtime, and playtime. Our coordinated starter sets complete necessary wardrobe essentials a new baby needs. They also makes great gifts.